We've taken one of the best the traditional British biscuits and taken it to the next level. 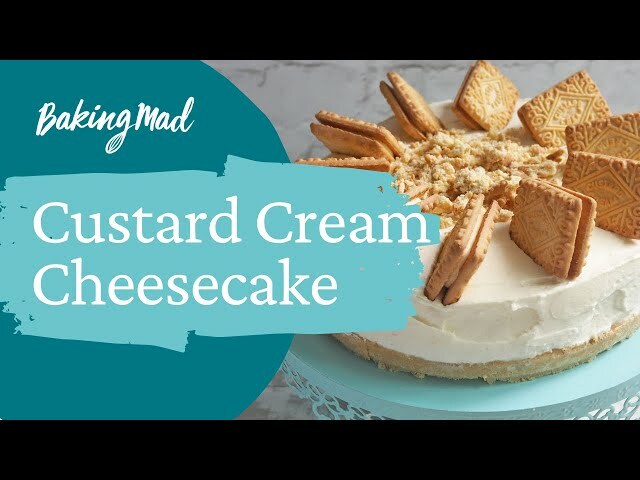 Introducing the Custard Cream Cheesecake! Not too sweet, this cheesecake offers a palette cleansing masterpiece which will leave your guests or family deliciously satisfied. If you love this recipe, you might want to try our Toblerone cheesecake next time! Using a food processor, blitz the biscuits into a fine rubble, and then add the butter, pulsing until the mixture begins to clump. Press this mixture into the base of the tin, then pop in the fridge to chill. To make the filling, gently stir the cream cheese with a wooden spoon to soften it, but be careful not to beat to hard as it will go runny and will no longer be of use. In another bowl or in a stand mixer, whisk the cream with the sifted icing sugar, vanilla and custard flavouring until it has soft peaks. Take care not to over whip it. Gently fold the cream mixture into the cream cheese. Spread this over the biscuit base and then chill again for at least 4 hours or overnight until set. When you are ready to serve, remove the cheesecake from the tin and decorate the cheesecake with more custard creams.